Great neutral scent. Perfect for work. 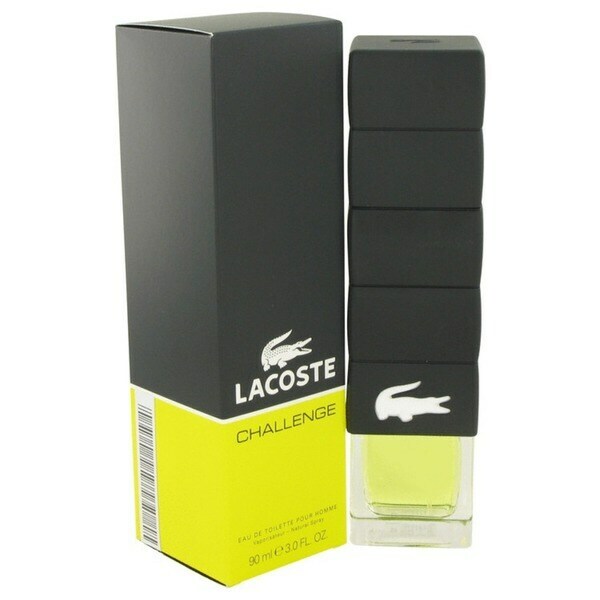 Lacoste Challenge perfume was introduced in 2009 by the design house of Lacoste. Available in a three-ounce bottle, this eau de toilette spray combines citrus, spicy and woody notes to emphasize a strong masculine scent that instantly boosts your confidence. This invigorating fragrance is ideal for the office as well as an evening out. This Lacoste Challenge spray also makes a great gift for the man in your life. Great scent, love all Lacoste scents but this is one of my favorites from their collection, well done! I had tested this product at a local store and liked the scent and was ready to pay $40.00 for a bottle half the size of the one I purchased on O.co for the same price. I liked the scent in the store but wanted to know my wife's opinion before I bought it. She too liked the scent but told me to check this website before buying at the local retailer. I'm glad I did. I got the 3 oz bottle for the same price as a 1.4 oz bottle at the local store. This is a great scent at an awesome price. Be sure not to spray too close to your skin as the scent becomes super concentrated and is almost overwhelming. Spray the recommended 6 to 8 inches away and you're gonna smell great all day long. If you want a sporty, masculine, and distinct fragrance made especially for a man, this is it! Challenge has a deep, musky scent that is all-male. Some women buy men's fragrances for themselves, but they won't be buying this. It definitely is suited for a man. It's warm and rich. My foreign friends from Asia said that it is too strong for them (Asian males tend to like lighter, sweeter scents), so you should have an active, extroverted personality to match this. It's definitely not subtle. I recommend you try it at a department store first rather than ordering it here without smelling it because it is so distinct! The matching shower gel alone is very nice, too. Love this stuff. Definitely a favorite scent of mine. Highly recommended! One of my sons loves this fragrance, his 35 years old and very sharp with his appearance. I love the the cologne it is long lasting and the price was a good price for the size of the bottle. I have gotten very nice compliments from my female co-workers and on the street it is a very nice cologne. best men's perfume. Could no find it any store except overstock. Has been discontinued and could not find it anywhere else. My boyfriend loves this cologne, and it's not offered anywhere else. Thanks for keeping this in stock! Have always used this product, but it is no longer available in store. "Do you guarantee this perfume to be an authentic Lacoste product and not an imitation? The markets are rampant with counterfeit goods. Do you ascertain product authenticity or do you just presume it?" Yes, we stand behind all of our products'' authenticity.